We are constrained by technology and natural resources, among other things, but a limited supply of dollars is a political myth, writes Dr Steven Hail. IS THE GOVERNMENT out of money? If the government borrows too much money, will we end up like Greece? If we print money, will we turn into Zimbabwe? Don’t banks create all the money and then lend it to the government? What exactly is "money", in any case? What does a dollar represent? In one sense, money is a scoring system — like runs in a cricket match. Just a way of accounting for the value of what has been produced, or who is a winner and who is a loser in the game of profit and loss. Economists talk about money, in this sense, as a "unit of account". In another sense, money is a "thing". Often, historically, a physical thing — like coins and notes or (much earlier) clay tablets, but these days increasingly an electronic "thing", as in the "virtual" dollars which are recorded as residing in your bank account, or in turn in your bank’s account at the Reserve Bank. It is that thing which you can exchange for goods and services, or use to pay off your debts. Economists talk about money in this sense as a "medium of exchange". When we imagine money as a physical thing, it encourages us to think of it as though it was gold or some other commodity. This suggests money is in fixed supply; that governments can run out of money; that government spending must be paid for in advance, out of taxes or by borrowing; that government borrowing today imposes a burden on the next generation, who will have to find the scarce money to pay off the government’s debt and the interest on that debt. This is what most people believe to be true. And yet, in countries like Australia, it just ain’t so. It is based on a misunderstanding of what modern money represents and also, in part, on a mythical story of the origins of money. The myth is an old story, which has been commonly believed for at least 250 years. The story goes that humans have a natural urge to trade and that before the discovery of money, this was done using barter (the exchange of goods for goods). Barter was too inefficient to support more than a primitive trading system and so, eventually, at least one commodity became generally acceptable as having value in exchange for all other goods. Money was off and running. According to the myth, money evolved naturally, without the intervention of power institutions of any kind. In this tale, which I won’t repeat here, governments enter the story of money rather late on, eventually messing up a naturally stable system of commodity money. The abandonment of the gold standard by the USA in August 1971 supposedly marked the final betrayal by modern governments of a naturally stable system which had no need for governmental institutions at all. Governments confiscate taxpayers’ money. Governments create inflation and instability. Governments are generally bad news. So goes the story. The thing is that there is apparently no evidence that this is true. None at all. In the case of ancient Mesopotamia, in particular, there are good reasons for believing that what became the social institution of money developed in a different way entirely. The development of farming allowed for the emergence of religious and governmental institutions. Soldiers, administrators and priests needed to be provisioned, and accounts had to be kept of how this was being done. Tributes and taxes had to be raised in order to make this possible. The earliest sense in which money existed was as a way of recording the value of such tributes and taxes. The earliest unit of money as a scoring system may have been weights (or shekels) of barley, in places like Uruk, at least 5,000 years ago and probably well before that. Not that taxes had to be paid in barley. They were just valued in these units. You could pay your taxes or tributes in a wide variety of items that the temple community could find a use for, as anthropologist David Graeber explains in his Debt: The First 5,000 Years. The invention of government, accounting, taxation and money appear to have created early markets, specialisation and trade, and even credit and finance. Money as a thing was whatever you needed to obtain to pay your taxes. Governments were then able to spend by issuing token money which could be used in the future to pay taxes back to the government. Perhaps clay tokens were the earliest form of token money and, in some ways, not all that much unlike a modern $50 note. Thousands of years later, when coins were issued, the face value of a coin was generally greater than the intrinsic value of the metal within the coin. Precious metal content was important when the coins were used far from the jurisdiction of the issuing authority, but within the community, money had value because you could use it to pay your taxes. At the centre of every successful monetary system was a strong government with the power to raise taxes. Governments issued money when they spent and took some of that money back again in taxes. Chinese emperors were obviously not in Rome, but they still did as the Romans did. This is how state money worked. Why is all this relevant to us today? Because the modern money we are familiar with is far less different to the ancient monies of thousands of years ago than you might imagine. Our dollar is the scoring system used by our government to measure your tax liabilities, just like shekels of barley in Mesopotamia. Our dollar is the thing spent or lent into existence by our government and central bank, just as ancient governments were able to create token money, valued in the units they chose. The role of taxation now, as it was then, is to create a demand for money. Taxes are needed to ensure that total spending does not exceed what can be produced in the economy, in such a way as to create inflation and reduce the value of money. Taxes drive money, as they always have. This doesn’t mean taxes pay for government spending. Money, remember, is not a thing in short supply and governments create money every time they spend. Taxes merely destroy some of that newly created money. Indeed, if the private sector is to be able to build up its savings of money over time, then absent a trade surplus with the rest of the world, governments have to spend more than they tax. They have to create more government money than they destroy. 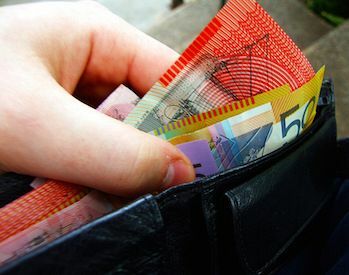 It is true that private banks create a great deal of what you and I regard as money when they lend to us, but they are only able to do this because those deposits they create when they lend represent a commitment by those banks to use their accounts at the Reserve Bank of Australia to pay our bills, including our taxes to the government. Those bank balances at the RBA, like the notes and coins we carry around with us and like government securities issued by the Treasury, are created by a government which can no more run out of money than the scorer at the MCG can run out of runs during a game of cricket. That old story about money misleads people. It distorts the public discourse on economic policy. It impoverishes us all. Money is not a commodity in fixed supply and it never was. It makes more sense to think of money as a scoring system in a game, or as numbers on a spreadsheet. If the numbers that governments type into their spreadsheets are too high, then they can cause inflation. But a government like ours can never run out of money. Governments fix the rules of the money game and they have done for thousands of years. Governments still issue currencies — we still use them. The government does not need taxpayers’ money: taxpayers need government money. It is the other way around. This has implications for economic policy, which are discussed elsewhere, including here and here. It also provides us with an answer to our initial question. What is a dollar? It is a creation of the government. It is the scoring system used to measure the taxes you have to pay to the government. It is the thing the government is prepared to accept in the payment of those taxes. That’s all it is. No great mystery. But, no, the government can’t run out of dollars. They can’t really meaningfully borrow them either — how can you borrow your own IOU? They could print too many and cause hyperinflation but they won’t. It is important to understand that our limited means as a society relate to our natural ecology, our efforts and skills, our technology and physical capital and our natural resources. We are not constrained by a limited supply of dollars. The dollar isn’t a commodity we can run out of. Don’t be misled by the myth and a political discourse that treats that myth as though it was a reality. You can read more by Dr Steven Hail at erablogdotcom, follow him on Twitter @StevenHailAus, as well as on Facebook at the Green Modern Monetary Theory and Practice. Value for money. Subscribe to IA for just $5.